Kick off your visit on the 15th (Fri): examine the collection at The Mob Museum, then don't miss a visit to The Strip, and then admire the local landmark of Bellagio Fountains. On your second day here, try to win big at Paris Las Vegas, try to win big at Bellagio Hotel and Casino, and then explore the stunning scenery at Red Rock Canyon National Conservation Area. To find photos and other tourist information, read our Las Vegas visit planner. Rio de Janeiro, Brazil to Las Vegas is an approximately 18.5-hour flight. You can also do a combination of bus and flight; or do a combination of flight and bus. The time zone difference when traveling from Rio de Janeiro to Las Vegas is minus 5 hours. When traveling from Rio de Janeiro in March, plan for slightly colder days in Las Vegas, with highs around 27°C, while nights are much colder with lows around 13°C. Cap off your sightseeing on the 16th (Sat) early enough to travel to Grand Canyon National Park. Take a break from the city and head to Rim Trail and Bright Angel Trail. The adventure continues: explore the stunning scenery at Grand Canyon South Rim, stop by Canyon Village Marketplace, make a trip to Grand Canyon Village, and trek along Cape Final Trail. For photos, more things to do, ratings, and tourist information, refer to the Grand Canyon National Park itinerary maker website . You can do a combination of car and flight from Las Vegas to Grand Canyon National Park in 4.5 hours. Other options are to drive; or take a shuttle. Due to the time zone difference, you'll lose 1 hour traveling from Las Vegas to Grand Canyon National Park. Expect a bit cooler weather when traveling from Las Vegas in March: highs in Grand Canyon National Park hover around 16°C, while lows dip to -5°C. Wrap up your sightseeing on the 21st (Thu) early enough to travel to San Francisco. Start off your visit on the 22nd (Fri): snap pictures at Golden Gate Bridge, then steep yourself in history at City Lights Booksellers, then take in the waterfront at Fisherman's Wharf, and finally step off the mainland to explore Alcatraz Island. Here are some ideas for day two: don't miss a visit to Book Passage, then buy something for everyone on your list at Ferry Building Marketplace, then tour the pleasant surroundings at Fort Funston National Park, and finally take your sightseeing to a higher altitude at Twin Peaks. To find ratings, traveler tips, other places to visit, and tourist information, use the San Francisco online vacation maker . Do a combination of bus, flight, and subway from Grand Canyon National Park to San Francisco in 8.5 hours. Alternatively, you can do a combination of bus and flight; or drive. The time zone difference moving from Mountain Standard Time (MST) to Pacific Standard Time (PST) is minus 1 hour. Traveling from Grand Canyon National Park in March, expect nights in San Francisco to be much hotter, around 11°C, while days are somewhat warmer, around 21°C. Finish your sightseeing early on the 23rd (Sat) so you can drive to Yosemite National Park. Get in touch with nature at North Dome and McGurk Meadow. Spend the 26th (Tue) exploring nature at Elizabeth Lake, Yosemite National Park. And it doesn't end there: take your sightseeing to a higher altitude at Cathedral Beach Picnic Area, take in the dramatic natural features at Glacier Point, and look for all kinds of wild species at Nature Center at Happy Isles. For maps, reviews, ratings, and tourist information, go to the Yosemite National Park journey maker site . Getting from San Francisco to Yosemite National Park by car takes about 4 hours. Other options: do a combination of flight and car; or do a combination of subway, flight, bus, and taxi. While traveling from San Francisco, expect slightly colder days and cooler nights in Yosemite National Park, ranging from highs of 13°C to lows of -5°C. Finish your sightseeing early on the 26th (Tue) to allow enough time to travel to Los Angeles. Kick off your visit on the 27th (Wed): admire the striking features of Walt Disney Concert Hall, then shop like a local with Guitar Center, then tour the pleasant surroundings at Will Rogers State Beach, and finally tour the pleasant surroundings at Venice Beach and Boardwalk. Get ready for a full day of sightseeing on the next day: immerse yourself in nature at Royal Palms State Beach and then take a peaceful walk through Oak Canyon Nature Center. For where to stay, photos, ratings, and tourist information, you can read our Los Angeles travel route planner . Getting from Yosemite National Park to Los Angeles by combination of car and flight takes about 4.5 hours. Other options: drive; or do a combination of taxi, bus, and flight. Traveling from Yosemite National Park in March, things will get much warmer in Los Angeles: highs are around 27°C and lows about 14°C. Finish your sightseeing early on the 28th (Thu) to allow enough time to drive to San Diego. 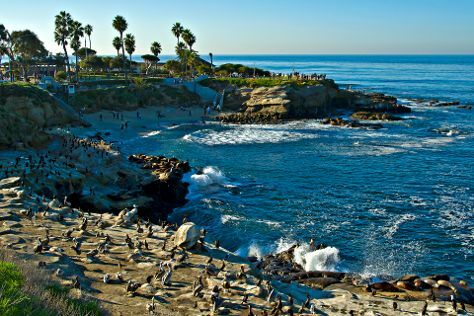 Visiting La Jolla Cove and San Diego Zoo will get you outdoors. Visit Black's Beach and Mission Beach Park for some beach relaxation. Take a break from San Diego with a short trip to Lions, Tigers & Bears in Alpine, about 58 minutes away. And it doesn't end there: immerse yourself in nature at Torrey Pines State Natural Reserve, sample the fine beverages at Malahat Spirits, explore the activities along Scripps Institute of Oceanography Coastal Reserve, and take in the exciting artwork at Spanish Village Art Center. To see other places to visit, reviews, where to stay, and more tourist information, refer to the San Diego route app . Traveling by car from Los Angeles to San Diego takes 2.5 hours. Alternatively, you can take a bus; or fly. When traveling from Los Angeles in March, plan for a bit cooler days in San Diego, with highs around 24°C, while nights are about the same with lows around 15°C. Wrap up your sightseeing on the 1st (Mon) early enough to travel back home.